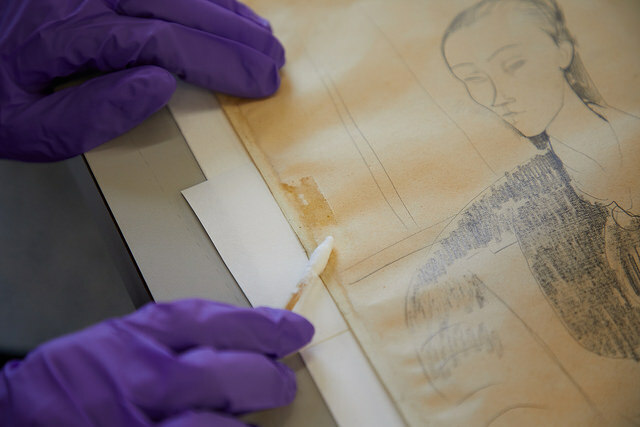 The drawing is a small, pencil on paper work titled “Portrait of Lunia Czechowska,” and dated from 1916. Modigliani was in Paris at the time he met Lunia, a Polish woman, whom he met through his patron and dealer Leopold Zborowski. Modigliani is known to have made at least seven paintings featuring Lunia, and possibly even more drawings and sketches. Although she was married, Modigliani was infatuated by Lunia, and he never ceased to pursue her. In this representation of her, Lunia is shown seated, from the knees up, and turned three-quarters towards us. She is wearing a dark, long sleeve dress with a white collar and remnants of a cameo at her neckline, much like the outfit she is wearing in a later portrait, shown above. Her right arm is draped over the back of the chair, and her hands are clasped gently. Her hair is pulled back, emphasizing the simple planes of her face. Her expression is calm and cool. The piece came to The Center matted and framed. Our Paper Department noticed that the work exhibited minimal distortion throughout and reported inherent age-related discoloration. Upon closer examination, our Paper Conservators found tape stains, including the gummed tapes located at the verso around all four edges, and minimal foxing throughout. Our Framing and Gilding Department reported that the frame was composed of wood, compo, gesso, and gold leaf, and that the finish was original to the frame. They also noticed minor scratches and abrasions throughout and a minor layer of surface grime. Meanwhile, our Custom Framing and Fabrication Department noticed that the matting was acidic, as was the bright orange backing board. 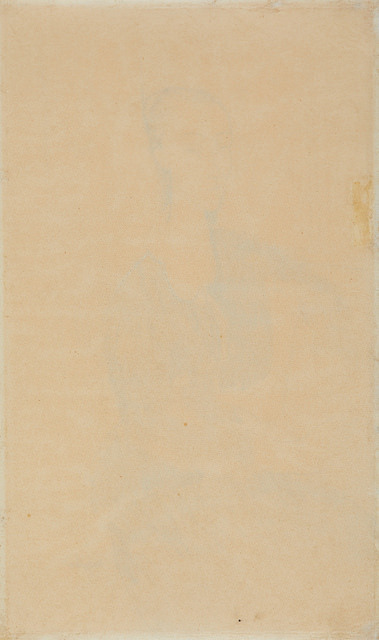 Orange, a unique color choice for a backing board, helped give the drawing a warmer tone. Additionally, the glazing was too small for the frame. After the thorough examination by our team, work was able to begin. First, the drawing was surface cleaned. 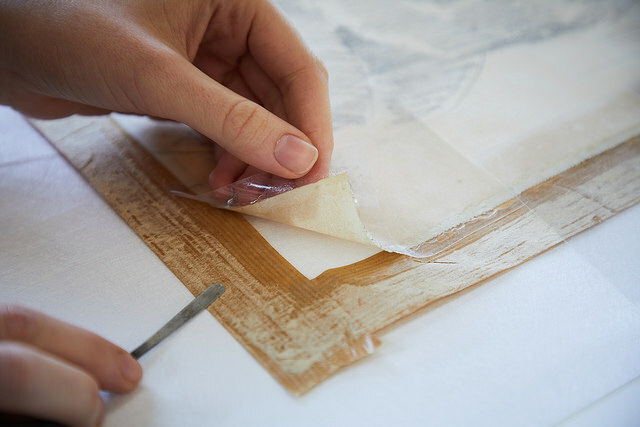 Next, the gummed tapes, which were also pressure sensitive, were lifted using the appropriate poultice techniques. The sheet was humidified and flattened to reduce deformations as best as possible, then dried between cotton blotters under the weights. The frame was mechanically cleaned, then minimally solvent cleaned. Any abrasions and scratches were inpainted to emulate the surrounding surface, and a protective layer microcrystalline wax was applied. 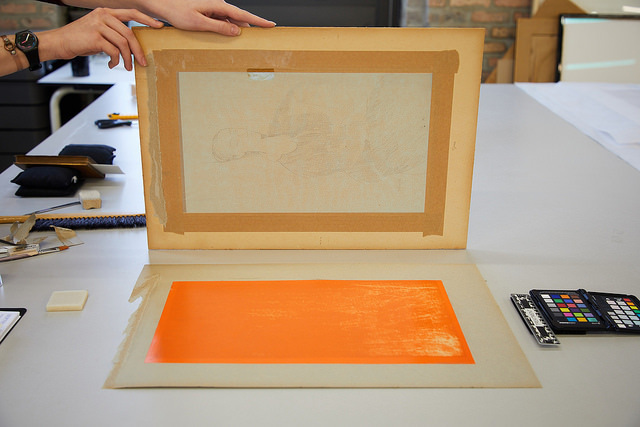 The fillet was replaced, as was the acidic matting, and the acidic backing board was removed and replaced with a similarly-toned orange archival one. Additionally, the small glazing was replaced with Conservation Clear glass that helps protect against UV light rays. 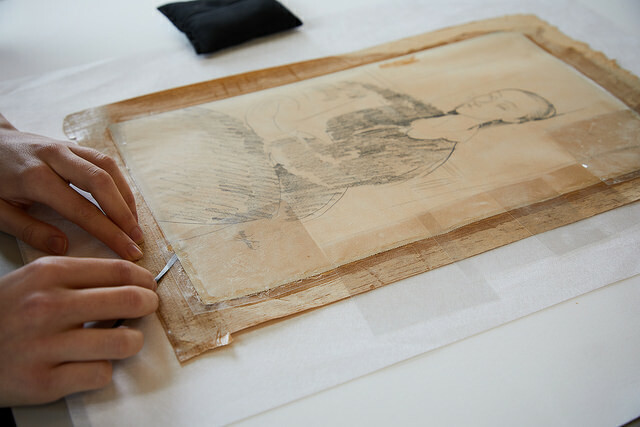 The work was reinstalled into the frame to conservation standards and for the finishing touch: an acid-free Coroplast backing board was attached to the reverse to provide additional protection.